An inflatable 8-meter brown bear floating off into the Moscow sunset followed by applause from the stands during the closing ceremony of the 1980 Summer Olympics is perhaps one of the most colorful moments in the country’s sports history. It took Russia 30 years to win the right to host the high-profile event again, with the one-year countdown to the 2014 Sochi Winter Olympics beginning Thursday. After winning the Olympic bid in 2007, the country’s authorities started a massive upgrade of infrastructure in the Black Sea resort 1,680 kilometers south of Moscow, which is getting new roads and railroads, luxury hotels and state-of-the art stadiums. But unlike in the Soviet era, when hosting the Olympics was universally perceived as a matter of national pride, some Russians don’t appreciate the government’s efforts. 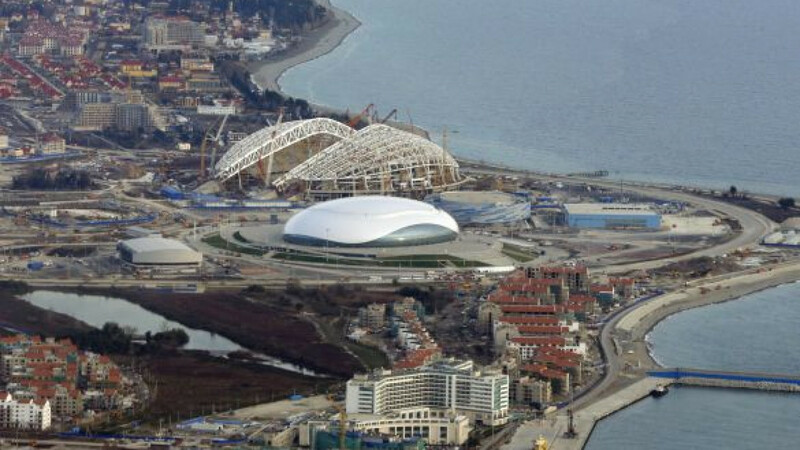 Despite official promises that preparations for the games will make Sochi a better place to live, locals say they are tired of living on a big construction site, as the resort town has frequently been referred to over the last few years. “Construction work is everywhere, all the roads and pavement are dug up, there’s mud and trash all around,” said Alexander Bugayov, a worker at the Sochi meat factory. The locals spend hours in traffic jams every day, he added. Some were harsher in their judgment. “Most of us don’t really care about these Olympics, and most won’t go watch the games, especially if they hike prices,” said Andrei Gavrilov, a real estate agent who lives in Sochi. He also complained about the inconvenience caused by the construction. Gavrilov said there’s hope the city will benefit from hosting the games, with investment in transportation infrastructure widely expected to improve the traffic situation. But he doubted that the huge expenditures on construction of sports facilities would pay off. “The local population lived OK even before the Olympics,” he said. The preparations for the games have taken place amid ongoing disputes and scandals regarding housing that was demolished to make way for Olympics-related construction, while environmentalists warned that cutting forests for road construction could be too high a price to pay for national prestige. But the financial side of the project has remained in the spotlight, since the rising costs of preparing for the games have provoked discussions about corruption and embezzlement. Opposition activist Boris Nemtsov mocked officials for various violations during the preparations, citing construction of a new road between Adler and Krasnaya Polyana that cost about 260 billion rubles ($8.6 billion) as the most outrageous example of possible embezzlement. “This road could have been covered with a 5-millimeter layer of gold or a 5-millimeter layer of black caviar and the price would have been approximately equal,” Nemtsov told RBC television last week. He added that there was no need to build the road and that a cable car would have been a much cheaper transportation option. While Olympic construction has entered its final stage, Deputy Prime Minister Dmitry Kozak, who oversees preparations for the games, said at last week’s meeting of the state commission in charge of Olympic preparations that a number of problems, such as hotel completion and energy supply, have yet to be resolved. But he urged the commission members to ensure that deadlines are met, and he told them to work out a plan for emergency situations. “The Olympics must start Feb. 7, 2014, at 8 p.m., and not a minute later,” Kozak said. Olympic construction. More than 400 new facilities and infrastructure elements are to be built. Competition will be held at two major sites, one in the Imereti lowlands and the other in Krasnaya Polyana, where more than half of the 13 sports facilities planned are still under construction. The Imereti lowlands, near the Black Sea, will get an Olympic park with arenas for competitions on ice. The central stadium, which will host the opening and closing ceremonies and hotels for athletes and IOC officials, will also be here. The Krasnaya Polyana complex, in the hills outside town, will have facilities for biathlon, ski and bobsled competitions. The deadline for completing all construction work is July 15, since a rehearsal of the Opening Ceremony of the games at the central stadium is scheduled for Aug. 1. Russian tycoons involved in Olympic construction are likely to be exempted from property tax for the items they are building in the city, Izvestia reported Monday. The Audit Chamber recommended that the government provide tax holidays to one of the biggest private investors in Sochi, billionaire Vladimir Potanin’s Interros holding, the report said. If the move is approved, all other private investors building in Sochi will get the same benefits, in line with legislation. Other big investors financing construction are Sberbank and Oleg Deripaska’s Basic Element holding. Tickets. Rumors fly as the official sale date approaches. A scandal broke out late last month after Izvestia reported that the maximum rates for some competitions would reach 40,000 rubles ($1,300). The Sochi 2014 Organizing Committee dismissed the rumor, saying the rates won’t exceed those at major domestic and international events. Most tickets will be available in the price category of 1,000 to 3,000 rubles, organizers said. Meanwhile, Kommersant.Dengi reported Monday that guests wanting premium seats to watch the opening and closing ceremonies would have to pay 50,000 rubles. The average ticket price at the Sochi Olympics will be 6,400 rubles. Hockey and ice skating competitions will be the most expensive to attend, with rates reaching a maximum of 34,000 rubles and 23,000 rubles, respectively, the report said. However, tickets for some competitions will cost just 500 rubles. Tickets for people living abroad will be available for sale via Olympic committee offices in individual countries and at the offices of official distributors, which are expected to be listed on www.sochi2014.com starting Thursday. Organizers will accept only Visa credit cards for online ticket purchases, according to the Sochi Olympics website. Visa also has a credit card monopoly for purchases and payments for services at event venues in Sochi, Kommersant.Dengi reported. Accommodations. Fixed prices, but still much construction to be completed. The IOC requires Sochi to have at least 41,500 hotel rooms to accommodate guests, games participants and committee executives. To meet this requirement, the city needs an additional 43 hotels with 24,000 rooms, and those are to be built in the city and surrounding area by 2014. A lack of construction workers is likely to result in 24 of those hotels not being finished on time, Kommersant reported Monday, citing commission documents. For construction to stay on schedule, about 1,200 units of building equipment and 22,600 construction workers (out of 95,000 planned) are needed, the state commission said. The government will regulate hotel prices during the Olympics to prevent operators from hiking prices. Rates will start at 2,900 rubles per night at a two-star hotel and won’t exceed 14,000 rubles per night for a five-star room, according to a decree signed by Prime Minister Dmitry Medvedev in December. A standard room at a three-star hotel will cost 5,700 rubles per night. Kozak insisted at a meeting with Medvedev in December that the room rates include breakfast. Volunteer staff for the games will be billeted on board cruise ships, with several vessels that can accommodate 8,000 guests each already chartered with foreign companies, Kozak said. Transportation. Short distances, fast trains. Guests and participants in the Sochi Olympics will be shuttled between venues by 54 Desiro high-speed trains made by Siemens under a contract for 586 million euros signed in 2009. The estimated time for the train to cover the 40 kilometers between the terminus stations, Adler and Esto-Sadok, is 30 minutes. A combined 48-kilometer road and railroad stretching from Adler to the Krasnaya Polyana ski resort is slated to become the main Olympic thoroughfare. The Desiro trains are expected to be put in service in Sochi this month. The road and rail link between Adler and Krasnaya Polyana is slated to be put into service in April. A high-speed-rail link between Moscow and Adler is planned, which will reduce travel time from 36 hours to 15 hours, according to the Russian Railways website. Security. Feeling safe, if you can get in. A valid ticket for the competition will not guarantee the right to be present at the games, as guests will be required to undergo a background check with federal security services responsible for safety at the event, according to a decree drafted by the Sports Ministry. After getting security approval, a ticket holder will have to obtain a special registration card, according to a document published on the Economic Development Ministry’s website in December. Emergency Situations Minister Vladimir Puchkov on Tuesday ordered departments in his ministry to check on safety aspects at venues. A special focus should be put on fire prevention, he said. To facilitate communication with foreign guests, a special English phrasebook for Emergency Situations Ministry officials and personnel has been compiled, ministry spokeswoman Irina Rossius told RIA-Novosti. Local police officers are also learning foreign languages, and professional translators will work at all local police stations during the games, the Interior Ministry said. President Vladimir Putin signed a decree in December simplifying visa procedures for foreign personnel and volunteers who will work at the Olympics. Kozak said earlier this week that work to clarify the procedure for obtaining Russian visas should be carried out around the world by the relevant Russian government bodies so that attendees avoid unexpected situations at border crossings.